Broadcast digital resources and learning activities to students directly to personal devices. Capture audience attention and manage immediate reactions. Provide real-time feedback and guide instruction. Extra Credit Grade: Students receive 80% of the credit for each answer they provide, 100% if the answer is correct. Peer Instruction: Students discuss the question in small groups before answering. Frequency: Approximately 5 questions are delivered per 50 minute classroom period. Reattempts: To focus on learning the concept, reattempts are accepted if many students incorrectly respond to a question. Professor Hector incorporated REEF Polling in the Spring 2016 semester within his undergraduate class, Architecture and the Environment (ARC 223). Key uses of iClicker and REEF Polling include: collecting attendance and measuring engagement with the course material during class time. In particular, Professor Hector leverages iClicker and REEF Polling to deliver numerical, analytical and problem-based multiple-choice questions. To ensure students become active participants and share the responsibility for their learning, Professor Hector also elicits further vocal student feedback or questions raised, once a poll has been delivered. Dr. DiResta has employed iClicker within his undergraduate courses for over six years, introducing REEF Polling in the Spring 2016 semester. Dr. DiResta leverages iClicker and REEF Polling to vary the lecture format, clear up confusion of fundamental concepts, and prepare for examinations. To complement the use of the response system for multiple-choice questions, open-ended questions are posed to small groups. Several answers or solutions from the students are selected to ensure they are critically thinking about the material. Professor Petersen employs iClicker and REEF Polling within his undergraduate courses at the University of Miami to electronically take attendance, encourage participation and initiate anonymous responses regarding sensitive topics. Professor Petersen gauges students’ support for certain criminal justice policies before a class session and then after once they have learned further about a topic. Sample quiz questions are also delivered via iClicker and REEF polling at the start of class to help students prepare for course quizzes. An interactive lecture tool (ILT) is an advanced platform also known as an audience, classroom, or student response system, used to gather real-time responses from students during instruction. Interactive lecture tools leverage the Bring Your Own Device (BYOD) approach to allow instructors to broadcast activities to personal devices (laptop, tablet, smartphone) during a lecture. Software and web-based interactive lecture tools such as REEF Polling, Nearpod and Top Hat offer an technology-driven approach to classroom management. Interactive lecture tools require initial configuration to successfully manage an session. This short video playlist provides a brief introduction to the tools. Set Up: A software application is installed or web-based platform is accessed by the instructor. The creation of an account and a course/session is required. Format: Within a web-based platform (Top Hat / Nearpod), an instructor can upload accepted file types (including PowerPoint), and format the presentation to include quiz questions, poll questions, videos, virtual field trips or drawing tasks. In contrast, ILT software (REEF Polling) launches a floating toolbar over existing presentations, resources and question prompts. Present: Using a lecture podium or personal device, an instructor will login and launch the ILT and session. To participate during a session, a student must register for an account, join the class via a designated class code or web-link and respond using a personal device. Using a floating toolbar or a web-browser, an instructor will broadcast content and interactive learning activities to student devices in real-time. Review: The learner data generated during and after a lecture allows an instructor to identify points of confusion andaddress concepts that need further instruction. An instructor can also integrate participation into an learning management system for grading purposes. Audience response systems are primarily used by to encourage audience participation and manage immediate reactions during events such as political debates, staff meetings, news broadcasts, conferences, workshops or market research. Political Speeches: The web-based response system, Microsoft Pulse captured positive, negative or neutral votes during the 2016 State of The Union (US) address by President Barack Obama via CNN and MSNBC websites. The dynamic results were shared with the public in real-time. Workshops: At the University of Miami, Miriam Glaser Lipsky (Senior Learning and Facilitation Specialist, Culture Transformation) used Nearpod in two workshops for individuals facilitating the Culture Transformation project. For a face-to-face workshop, over 20 participants simultaneously viewed presentation slides and responded to prompts delivered throughout the workshop. Participant results were then shared and broadcast. For a a virtual synchronous workshop, (used in conjunction with a conference call) resources and activities were broadcast to participants in real-time, allowing individuals to interact remotely in their office. In-Class Activities: At the University of Miami, Ji Shen (Associate Professor, Teaching & Learning, School of Education and Human Development) introduced Nearpod within two Teaching and Learning courses, Science Instruction in the Elementary School (TAL323) and Instruction and Assessment in Secondary Science (TAL 543) to 10 – 20 students. His goal is to provide students the practical experience with interactive lecture tools they may use in the future as educators in primary and secondary schools. Explore Non-Traditional Teaching Methods: At the University of Miami, Eric Brown (Associate Professor, Division of Prevention Science and Community Health, Miller School of Medicine) implemented REEF Polling and REEF Quizzing during their beta testing stage, providing user feedback to REEF Education and shape further software development. Over two semesters, Professor Brown introduced REEF Polling and REEF Quizzing to his graduate level course, Disease Prevention and Health Promotion (EPH 617) to investigate approaches to constructively engage students when discussing course concepts. The introduction of interactive lecture tools could fundamentally change the dynamic of a traditional lecture format in any instructional setting and any discipline. In classes with a large enrollment of students, the facilitation (and evaluation) of learning activities to assess student comprehension of course content can prove problematic. The various response types offers educators the opportunity to learn more about a student cohort and their capabilities, initiate a dialogue about course material, or guide instruction based on responses (just-in-time teaching). The prevalent use of personal devices in the classroom provides the opportunity for instructors to leverage interactive lecture tools to address accessibility needs, capture attention and intervene in potential distractions using the broadcasting feature. Time: Educators may need to allocate significant time to learn the features of the interactive learning tool, review existing strategies, and address how it will pedagogically enhance student learning. Integration: For students, issues such as account registration, forgotten devices, anxiety about grading and understanding the purpose of the tool can add complexity to using it. Content Creation: When creating learning activities through a web-based ILT (Top Hat, Nearpod), questions that require subscript for complex formulas (e.g. Chemistry, Mathematics) may need to employ LaTeX (a markup language) or the desktop toolbar over an existing slide deck. Presentations with transitions or animations are often lost once uploaded. Cost: While basic ‘teacher’ accounts are free, students are often required to pay a subscription for the use of an interactive learning tool. If different platforms are used across different courses, purchasing a subscription for different platforms can prove expensive for students. Limited Wireless Connection: The incorporation of any technology that leverages connection to wireless network may also hinder a student’s ability to participate if the system is down, or overloaded. Distraction: Personal devices are also connected to other social applications a student may launch during a session. If a note-taking application is being used within a session, switching back and forth may also further distract a student. Hardware-based response systems are therefore an alternative approach to a device-free classroom. BYOD: As interactive lecture tools rely on the Bring Your Own Device approach within education, there is an expectation that students will have a personal device that will align to the technical specifications, which may single out individuals unable to participate. 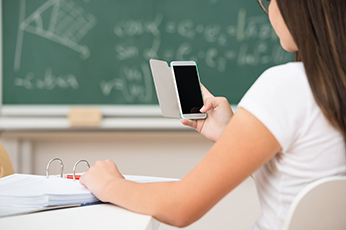 As access to personal devices increases, more interactive lecture tools may enter the market and eliminate the need for systems that require students to purchase stand-alone hardware, particularly in a device-friendly classroom. Recently introduced by Nearpod, simulated scenarios or virtual “field trips” immediately immerse students within a simulated environment, allowing them to explore a 360° video and points of interest (with the guidance of their instructor) through virtual reality headsets or personal devices. Currently available within selected interactive lecture tools, students can send anonymous questions to the instructor, which is then broadcast to other students, suggesting ILTs may support further ways for instructors to transfer ownership of a lecture to students. Interactive lecture tools will also need to adjust to the growth of online or hybrid courses and demand for both asynchronous and synchronous instruction. Try before you buy: Before the adoption of an interactive lecture tool, free(mium) audience response tools (Polleverywhere, Kahoot!, Twitter Polls, Pingo, Socrative, Nearpod, Quiz Socket) can allow an educator to reflect on existing practices, and assess their impact through the learner data collected. Measure changing responses: Pose a question at the beginning of the lecture about a particular topic before instruction, and pose the question again at the end of the lecture to compare. Think-Pair-Share: Before sharing the answer with students, ask students to individually respond, then group students to discuss in pairs of the answer they gave, then respond individually again. On-going course evaluations: Deploy anonymous course evaluation questions through the semester to review and implement student-led feedback in the course.